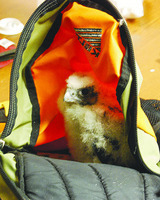 The Pine Journal ran an article about the peregrine chicks banded this season at the Sappi Cloquet Paper Mill. We unfortunately do not have more information about the birds after the article was written. It appears at least four of the five chicks survived the flooding that occurred a couple of weeks ago. The Midwest Peregrine Society, headquartered at The Raptor Center, coordinates the banding of peregrine chicks in the Midwest each year. Information on chicks, sites and states can be found at http://www.midwestperegrine.org/.